Beats RESNET Guidelines for Thermal Imagers! 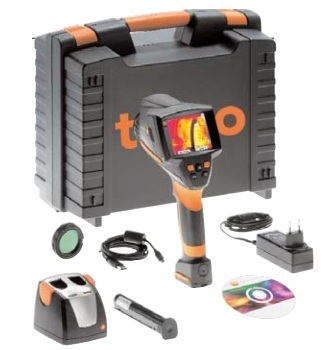 The Testo 875i-2 DELUXE Thermal Imaging Camera kit is the perfect imager to to quickly identify problems and defects in building envelopes. The Testo 875 has one of the best displays we have ever seen in an imager at this price point. Detection of condensation areas: Pinpoint potential high risk moisture areas with the Testo 875 and avoid mold growth with a thermal scan. Dimensions (L x W x H): 6" x 4.2" x 10.3"
Protective Lens (included): A protective lens, made of germanium, is simple to attach to the lens protecting the valuable optics from dirt and scratches. Telephoto lens: Field of view 9° x 7° / min. focus distance 20"
5040 TruReward$ points will be placed in your account when you buy this item.